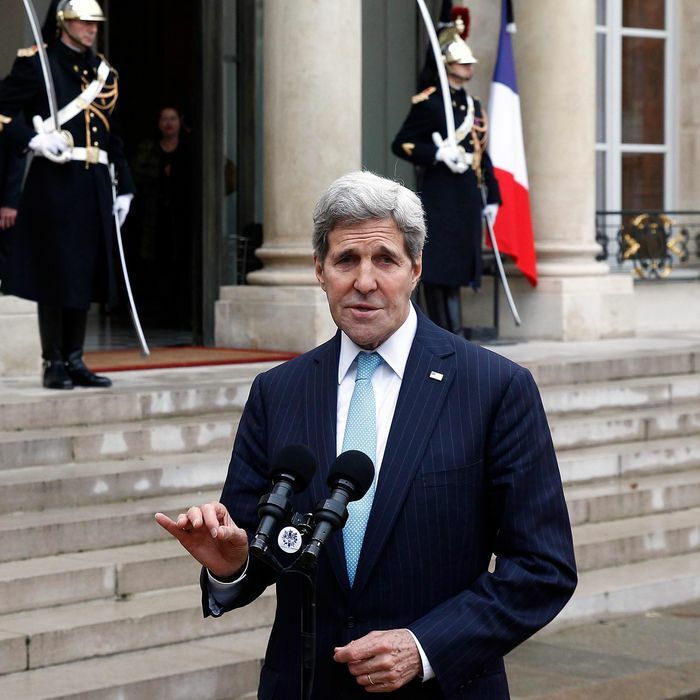 French-hater John Kerry covering up the Obama administration's deep disdain for our great ally. Extreme nationalism, by its nature, requires its adherents to form judgments about the nature of foreign countries that are clear-cut, but also wildly inconsistent over time, as the interests and alliances of one’s own country inevitably mutate. The current state of right-wing thought has gone beyond the natural sympathy one might feel toward the people of France in the wake of the barbaric murders in Paris toward a new line best expressed by Charles Krauthammer, the leading party theorist. “If the other goal of the Paris massacre was to frighten France out of the air campaign in Syria — the way Spain withdrew from the Iraq war after the terrorist attack on its trains in 2004 — they picked the wrong country,” writes Krauthammer. “France is a serious post-colonial power, as demonstrated in Ivory Coast, the Central African Republic and Mali, which France saved from an Islamist takeover in 2013.” Those French colors don’t run. Conservatives who now fervently believe they have always been the strongest of allies with France may need to expunge from their memory certain unpleasant events of the past. In the run-up to the Iraq War, nationalist fervor expressed itself in no small measure through intense hatred of that very same country, which represented everything they despised: generous social-welfare provisions, (alleged) cowardice, an attachment to diplomacy and international institutions. House Republicans officially changed the name of their cafeteria’s French fries to “freedom fries.” France was the heart of what Don Rumsfeld derisively called “Old Europe” and the subject of a 2004 book entitled Our Oldest Enemy, authored by a senior editor at National Review. Its essential qualities were treason and cowardice, its outsize role in world affairs a tragic relic. The highbrow version of this theory was elucidated by Krauthammer. “France pretends to great-power status but hasn’t had it in 50 years. It was given its permanent seat on the Security Council to preserve the fiction that heroic France was part of the great anti-Nazi alliance rather than a country that surrendered and collaborated,” he wrote in 2003. “Why in God’s name would we want to re-empower the French in deciding the post-war settlement?” he asked. It sought to form “a French-led coalition of nations challenging the hegemony of American power and the legitimacy of American dominance,” a treacherous scheme Krauthammer traced back to Charles de Gaulle. Now France is a “serious post-colonial power,” its decades of anti-American scheming forgiven and forgotten. Since Kerry had condemned the Charlie Hebdo attacks forcefully and without equivocation at the time they occurred, it stands to reason that he was not now changing his position on their legitimacy. Far more plausibly, Kerry simply inverted his sentence, calling the attacks “legitimate” rather than “not legitimate,” the way a diner might mistakenly request cheese when she meant to ask for no cheese, before correcting himself. But a wave of right-wing outrage again crashed upon the head of the hapless, gaffe-prone Kerry, whom the conservative media pummeled with conservative rage (sample headline: “John Kerry Justifies Charlie Hebdo Slaughter”). Now it is clear that Kerry’s alleged Frenchness was all along a ruse to conceal his secret disdain for our great and eternal ally.